This question may not be as popular as other music content questions that are been asked by a number of individuals. However, in an effort to answer this question a vast amount of information will be revealed. When the phrase “piano keyboard” is used, it is basically referring to the keyboard area that is been played by our fingers. The phrase is popularly used because individuals are looking for specific results pertaining to music rather than other subject areas. In other words the piano and organ has a keyboard but there are equipment such as type writers and computers that have a keyboard. In this case reference is been made to the keyboard that is used in music. The keyboard can be described as a set of adjacent keys on a musical instrument such as the piano, organ and synthesizer. The keyboard is made up of black and white keys. The black keys are grouped in sets of two and three, while the white keys appear beside each other. The white keys on the keyboard are called natural keys and the black keys are called sharp or flat keys. In music the terms sharp, flat and natural are represented by musical symbols. Below is a diagram showing what each symbol looks like. It is very important that you know these signs for future lessons. The keyboard on a piano is made up of 88 keys. However, other musical instruments such as the organ and synthesizer use shorter keyboards. Below is a diagram showing what the keyboard looks like. Each black and white key on the keyboard has a letter name. 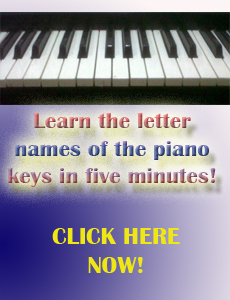 The letter name of each key is taken from the musical alphabet (A, B, C, D, E, F and G). ACTIVITY – Play the black keys on your keyboard according to the group they are assigned. For example touch all the black keys that are grouped in sets of two and then the others that are grouped in sets of three.